From one of the oldest to one of the youngest, one of the NBA’s top point guards ever will now look to take his basketball knowledge to the sidelines. Former triple-double machine Jason Kidd was introduced as the Brooklyn Nets head coach Thursday afternoon at the Barclays Center. Kidd, 40, will now become the fourth man to be a head coach directly after being a player since the 1976-1977 ABA-NBA merger. His deal is expected to be guaranteed for three seasons with a possible fourth-year team option, league sources say. The Nets organization has a soft spot for the kid coach who took this team from being lottery-bound year in and year out to a regular Eastern Conference champion during a six-year stint with the franchise. He will go down as the best New Jersey Net to ever play the game. Nets owner Mikhail Prokhorov and general manager Billy King are taking a risk—there’s no doubt. Whether you think this is a PR stunt or a move for the future, it is interesting that the Nets decided to make such a hire at this point with their current roster. This core of Deron William, Joe Johnson and Brook Lopez are under contract for a while and set in place for years to come; it would seem like the Nets organization would want a coach that wouldn’t need a “learning curve” as King said Thursday afternoon. That explains why they went after Phil Jackson and Doc Rivers—two established coaches that make more sense. Kidd will also be asked to better this team right away, which means winning more than 49 games. I mean, they just fired a head coach in P.J. Carlesimo that went 35-19 and was one game away from making it to the second round. The expectations are to win now and to win big. No matter how you believe he will do, this is exciting for the Nets and the NBA. Kidd has the chance to pull a Mark Jackson and put his imprint on this organization; he can make the Nets feel like a Jason Kidd team. I’m skeptical. However, I’m going to give him a chance to find himself in coaching. I was skeptical he would ever learn how to shoot. And only two players in league history have made more 3-pointers. If he puts in the extra work to better himself as a coach just like he did as a player, he could destroy my skepticism. Bringing D-Will to Dallas should clearly be the Mavs main priority going into this offseason. Well, that priority is in the hands of some Ping-Pong balls. The NBA uses a lottery system to decide the top three draft picks. Landing the worst record in the NBA will not guarantee the No. 1 overall pick, but it gives the best chance in a game of chance. 1. Fourteen Ping-Pong balls are labeled 1 through 14. 2. Each team will receive a certain number of 1,000 possible four-number combinations. (There are 1,001, so one is not provided to the teams.) The worst the record, the more combinations for a team. For example, the Charlotte Bobcats – the team with the worst 2011-2012 record – will be given 250 combinations and the Washington Wizards – the team with the second worst record – will be given 199 combinations and so on until all 14 teams have their appropriate digits. 3. After the balls tumble in the lottery machine for 20 seconds, four Ping-Pong balls come out in a timely manner. The team that received that four-number combination (the order does not matter) automatically takes the first pick. 4. The balls are then replaced, and the same process takes place to decide who will take the next two spots in the draft. If the one combination that is not assigned comes out (what are the odds? oh wait…), officials go through the process again. 5. After the top three picks, the rest of the teams take their placement based on their record. Therefore, the Bobcats can be no lower than fourth. Right before the NBA trade deadline this year, the Portland Trail Blazers sent swingman Gerald Wallace to the New Jersey (soon-to-be-Brooklyn) Nets for some insignificant players and a significant 2012 draft pick protected through No. 3. What this means is if the Nets land the No. 1, No. 2 or No. 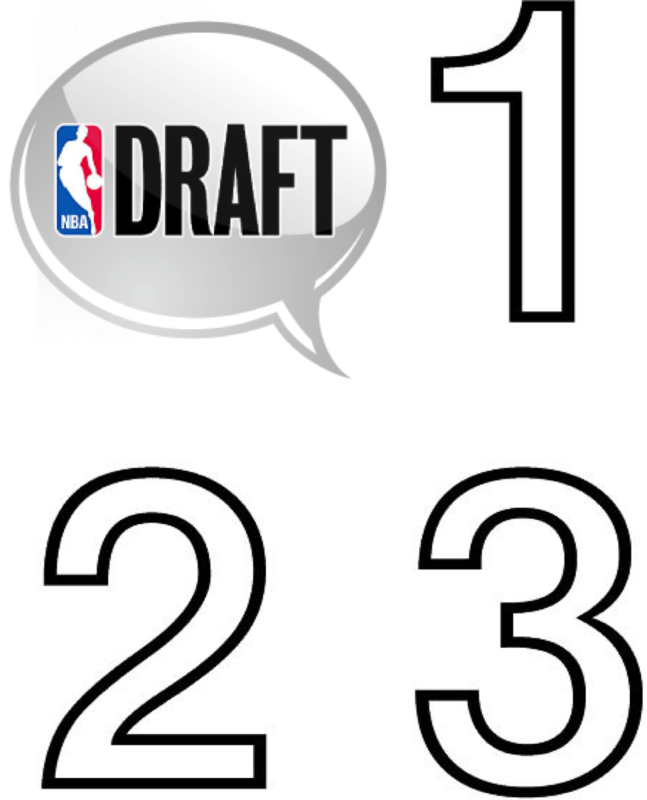 3 pick in the draft lottery Wednesday, May 30, that draft pick stays in Brooklyn. If they only fall down to No. 4, off it goes to Rip City. The Nets finished with the sixth worst record in the league at 22-44. Receiving 63 combinations for this placement, the Nets have a 6.3 percent chance of getting the top pick, a 7.1 percent chance of getting the second pick and a 8.1 percent chance of getting the third pick. So, how do all these numbers for the Nets relate to the Dallas Mavericks? If these Nets do have luck on their side and get one of these top three picks, consequently keeping the pick, they just landed the key to bringing Dwight Howard to their franchise, and it will then happen. If the Ping-Pong balls bounces in the Nets favor, they will use their pick to package a deal for Howard. There is absolutely no other scenario with a top three pick in Brooklyn. With Howard in Brooklyn, a haven for any professional sports league franchise, there is no doubt that D-Will will choose to sign an extension with the Nets. Yes, Dallas is his hometown, and yes, owner Mark Cuban has always treated his players very well. But come on. Brooklyn? Dwight Howard? Jay-Z? Williams would go no where with Superman flying into town. The Mavs have one mission this summer: bring Deron Williams home. Don’t be confused – it doesn’t matter what Cuban or Carlisle says to the media because they have to be politically correct about this issue. There are other free agents such as Roy Hibbert, Steve Nash and Eric Gordon that would be solid pieces for the franchise… but target A, B and C is Deron Williams, and everybody in the Mavericks front office knows this. Not only would this move allow the Mavs to have a franchise point guard for years to come since D-Will said he plans to stay with his next team for the rest of his career, but it leaves the option of Dwight Howard somewhat open. Even though the idea of the “three Ds in Big D” that has swirled through Mavs fans minds seems more unlikely than the New York Knicks deciding to let Jeremy Lin go, Williams coming to Dallas is step one in that two step process, leaving the idea in General Manager and President Donnie Nelson’s dreams. With a package sending Howard to Brooklyn for another package with a top three pick, the Mavs would have to go to their backup plan… which would be a very apparent backup plan. Convincing Williams to wear the blue and white instead of the black and white is exceedingly better than any other conceivable Mavericks plan for a multitude of reasons. The main one though pertains to the fact that Cuban forced a “bridge year” on his franchise this last season in order to make a big splash in this summer’s free agent pool. What this means is that Cuban let four key components to a championship squad go (to the great dismay of the Mavs fandom) because of the thought of signing Deron Williams and Dwight Howard this summer. He gave up the legitimate chance to repeat as champions for a tasty future. Since Howard signed an extension with the Magic for one more season, that leaves Cuban with one fish. The fish that swam through the Colony in Dallas 11 years ago. So, this Dallas hope of D-Will coming back will stay alive or quickly die with the picking of four white Ping-Pong balls. This hope can all but be dashed as Brooklyn would get their pair of superstars that could match any other superstar duo in the league. This hope no longer lies in the hands of Deron Williams. This hope lies in the hands of the official who manages the lottery machine. Good luck, Mark. What a dunk from Deron Williams as he contributed 28 points and 8 assists during Monday night’s game against Cleveland. The Nets starting forwards also played major roles in their team’s effort to win their 16th game of the season. Gerald Wallace brought 27 points and 12 rebounds to the table and Kris Humphries put up 13 points and 11 rebounds. What did the Nets get out of all of this? If tonight showed the nation anything about D-Will, it would be that he needs to be out of New Jersey. In a back and forth game between two of the worst teams in the Eastern Conference, the New Jersey Nets defeated the Charlotte Bobcats, 104-101, due in large – gigantic part to Williams’s out-of-his-mind play. When some of the best players get in a certain zone, they seem to make shots no matter who has a hand in their face or who challenges their shots. Williams had one of these nights. Whether he was pulling up for a jumper or crashing into the lane, he just kept scoring and would not allow his team to leave Time Warner Cable Arena without the win… and they barely got it. Who will Deron Williams be playing for in the 2012-2013 NBA season? That’s the problem right now for D-Will and hopefully he realizes it. In order to take down one of the worst NBA teams in the past decade, this point guard had to carry his team to victory and not in a good way. While the rest of his team crawled towards the finish line, Williams was sprinting but kept having to go back to push his team forward. This image represents the entire Nets 2011-2012 season. I don’t care if the Nets are playing in New Jersey or in Brooklyn or in Paris or on the moon, Deron Williams will not win if he re-signs with the team. It doesn’t matter how good he plays or the impact he has night in and night out – this team doesn’t have what it takes. Now, I understand Dwight Howard’s destination for the next NBA season plays a factor, but D-Will can only go off what he has in front of him… which is something hard to swallow. *Deron Williams’s 57 points stands as the New Jersey Nets franchise record, a career-high and the 2011-2012 NBA season-high for most points in a single game. *Only five point guards in NBA history have scored more points in a single game than Williams – Pete Maravich (68), Jerry West (63), Allen Iverson (60, 58), Gilbert Arenas (60) and Fred Brown (58). *Williams shooting 21-21 from the free throw line puts him three free throws away from the all-time record for most free throws made in an NBA game without a miss. Dirk Nowitzki holds the record when he shot 24-24 from the line in Game 1 of the 2011 Western Conference Finals. Little kids do not always “get what they want” even though tantrums will be thrown and fits will be made. However, there is a 6-11, 265 pound kid that will sooner or later get just what he wants. Known as Orlando Magic’s star center and Superman (sorry Shaq), Dwight Howard has made it known he wants out of Orlando. He is “requesting” a trade. No longer does he want to be with Stan Van Gundy, the Magic’s three-point shooters, and the town that embraced him as a young 18 year old. The Magic’s intentions with Dwight Howard have been anything but clear. There have been reports that they have been shopping Howard around and at one point even struck a deal with New Jersey. On the other hand, sources have also said the Magic have no intention of moving Howard before the trade deadline. With Dwight making his comments that he wants to be traded, he severely hurts the Magic’s ability to find a fair deal since teams consequently know the Magic have a disgruntled player on their hands that needs to be moved. Howard is tied to this Orlando team and should be compliant while under contract. He doesn’t own the Magic and doesn’t make their decisions – or isn’t supposed to. What about the effect it has on his teammates? All NBA teams go through slumps, but by coming together and leaning on their leader, good squads can face adversity and usually get out of bad stretches. Losing five of the past seven games, the Magic are in one of these slumps. So, when Dwight calls out his teammates for not trying, how can they take him seriously? Why would they listen to the man that selfishly “demands” a trade one second and then turns around to criticize his teammates’ play the next? It hurts team chemistry and the progress of a franchise. I believe this NBA offseason and season have shown a flaw in Dwight Howard’s maturity. Yes, he has a very entertaining personality, but that doesn’t directly translate into leadership. Until this 2011-2012 season comes to a close, Howard should be the leader the Magic expect him to be, but I am becoming skeptical he can do this as he makes more and more comments. Even though NBA players often speak their minds with no repercussions, I don’t believe the type of statements D12 puts out there should be allowed. For a player to publicly proclaim that he wants to be traded from an organization isn’t fair to his team. So, what is the solution to stop players like Shaquille O’Neal, Carmelo Anthony, and Dwight Howard from forcing their team’s hand? Fines seem like the only reasonable solution. Players would avoid making such harmful statements and this “cat-and-mouse” game would stop for good. Whether you agree or disagree with how Howard is handling himself, movement is inevitable. Here are the places he could possibly land and what they will need to happen for the three-time NBA Defensive Man of the Year to command their paint. to mark March 15th on their calendar. In order to bring the second Orlando Magic all-star center to Hollywood, the Lakers have to make an attempt at a trade for Dwight Howard. If Howard becomes an unrestricted free agent, the Lakers will not be able to compete with the other teams who have the cap space to take part in the Decision: Part II. They have to use their skilled players (mainly Andrew Bynum) and not their money to bring in this 26-year-old. Once the trade deadline passes in March, Los Angeles’s hopes of bringing another superstar to their city will be all but destroyed (again). Deron Williams and Dwight Howard to take a tour of Brooklyn… together. Next year, these New Jersey Nets and Jay-Z will be moving the organization to the Barclays Center in Brooklyn. This new look and feel for the Nets will be their primary incentive for Howard to join the team since wins can’t and won’t be a guarantee with this move. However, if Deron Williams decides he wants to re-sign with the Nets, it becomes likely D12 would seriously consider moving north. It will be all or nothing for these New Jersey Brooklyn Nets next offseason. the media to stop creating a trade for them. ESPNChicago put out a story this week pointing out that Howard would be “open” to play with the Chicago Bulls and Derrick Rose, which turned into the Bulls being added to contending teams for the big man. Oh wow, someone out there wants to play with the reigning MVP and the #1 team in the Eastern Conference – what a surprise. Simply because a reporter confronted Howard about possibly playing for the Bulls, and he said he would consider it doesn’t directly translate into Chicago being interested in him. The Bulls went to the Eastern Conference Finals last year, currently stand at 18-6, and have a winning formula set in place for many years to come. Dwight Howard is not a part of that plan. a championship. It’s plain and simple for the Orlando Magic. Without a championship ring on Dwight Howard’s finger after this season, there isn’t a possible outcome leading to D12 re-signing with the team he has been with for his entire career. to become Orlando Magic fans. In the Mavericks’ situation, they don’t have the pieces to make a trade for Howard. The only way D12 will be doing the D-Town boogie is by means of a signing during this summer’s free agency. With each successive loss and negative statement made by someone connected to the Magic organization, the likelihood of a Dwight Howard trade increases. The Mavs don’t want a trade. They want the Magic to be just successful enough that they believe they can make a run for the championship this year. This would keep them from giving up on Howard and the current team, leading to #12 becoming an unrestricted free agent in July. If that is the case by the time this summer roles around, Mark Cuban will have a chance to make the biggest free agency signing his organization has ever seen. Is the Grass Greener in Brooklyn? Even with the current NBA lockout, Jay-Z has no intention of slowing down his work with his Nets. The New Jersey Nets stated earlier this year that they will be moving out of New Jersey and into New York in the 2012-2013 NBA season. As a part owner of the team, Jay-Z just recently came out and made it known that they will become the Brooklyn Nets once this transition takes place. Not only will Jay-Z be implementing this new name into the organization, but he will also be commemorating the move by having multiple concerts. He even pointed out his similarity to LeBron James when he mentioned he will have “maybe one, maybe two, maybe three” concerts for the modified team. Even though this is a great move for a franchise that has struggled to be significant since the Jason Kidd era came to a close, will it be enough to put the Nets back into NBA relevancy? I have a hard time believing this move will spark a revival for these struggling Nets. The fact that they followed up a 12-70 season with only a 24-58 2010-2011 season even with multiple acquisitions such as Derrick Favors (now a Jazz), Jordan Farmar, and Deron Williams shows an inability to improve. Their offense also reflects their stumbling ways, being dead last two seasons ago and improving only two spots higher this past season. I believe they will actually make progress in the next season, maybe even achieving 40 wins. But there is one reason we can’t count on that lasting long: Deron Williams. During the most recent NBA season, the Nets wanted a change; Devin Harris was their trading bait and they wanted a buyer. They first went for LeBron, then went for ‘Melo, and finally ended up with Williams by means of a trade with the Utah Jazz. However, I believe when #8 becomes a free agent in the 2012 offseason, he will decide against continuing his tenure with the New Jersey (or Brooklyn) Nets. Even though some people might believe this is my partisanship showing its true colors, I am a firm believer Williams will be a Maverick for the 2012-2013 season, just as his point guard predecessor decided to do. Not only has he shown support for the Mavericks and Rangers, but Dallas is his hometown, something that always stays close to an athlete (just ask Carmelo Anthony and LeBron James – well maybe he’s a bad example). Furthermore, he would be able to effectively and comfortably transition into the starting role as Kidd is coming to the end of his career. Other than Brendan Haywood’s recent mammoth of a contract, the Mavericks have efficiently signed all of their players, including Dirk with his pay cut. If simply signing him off the free agent market ends up being too much of an economic burden, a sign-and-trade that brings Deron to Dallas is just as plausible. So, the possibility of Dallas having another ex-Net point guard seems very real. Now, I know I focused on the possibility of Williams moving to the Big D, but I did this for a reason. The Nets have made it known that they intend for Williams to be the face of this new Brooklyn team. Averaging a double-double in points and assists the past four seasons shows his consistency and explains the reasoning behind the Nets desire to revolve the future of their franchise around the Colony boy. If D-Will does in fact leave the Atlantic Division for the Southwest Division, there will be many baffled Brooklynites. What I would suggest the organization do is what the Nuggets did – execute a sign-and-trade. This way, at least they get something out of the deal rather than an empty roster spot (just ask Cleveland how it feels). Moving to Brooklyn is a smart and constructive change for the Nets organization; change is always good for any business in any field that is struggling to increase its value. It might in fact bring about just what this team needs and lead them to success. However, the hope the Nets staff and fans are putting in this young man will quickly disintegrate if he moves to another team, and even with the positive relocation, in the end, the Nets might find themselves right back where they are today. Sub-par.